Alex and I have revamped our website. It's not much now; there's still a bit of work to be done. But we hope that it will be a link to our friends and family as we continue in our life together. We want to stay connected with everyone, but let's face it, not everyone is going to sign up for a facebook account. So that's what this website is for...we will blog about the latest events, post pictures of all the new things we encounter, and maybe even share a few videos (perhaps an Mtv Cribs style video of our apartment in North Carolina?). 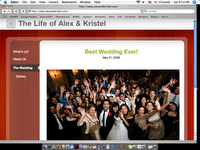 Bookmark alexandkristel.com and check back often for the update on the life of Alex and Kristel.